The Matsuo Taisha Shrine has a location in the west of Kyoto within easy reach of Arashiyama. 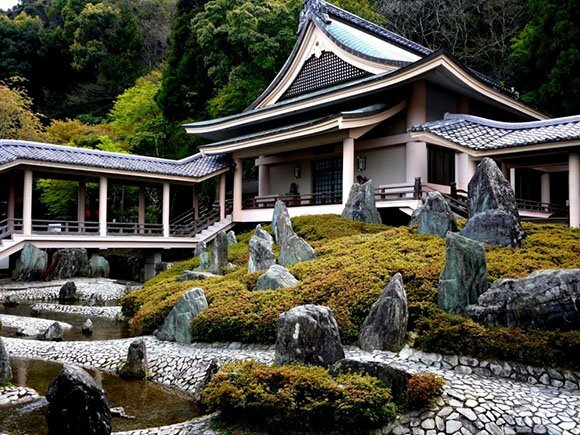 It is best known for its stunning gardens and its connection to the well known Japanese rice wine drink, sake. Founded centuries ago in 701, this interesting shrine which is occasionally called Matsunoo, offers plenty for tourists to see and explore, yet is still one of the least crowded shrines in the area. The Matsui Taisha Shrine was founded almost a century before the city of Kyoto itself by the Hata clan, a family group that had an instrumental role in bringing the brewing technique for sake from Korea. For this reason, the shrine has a long connection to the production of this drink, and brewers still take water today from the Kame no I sacred well in the shrine. The shrine’s gardens were designed by Mirei Shigemori, a famous painter and landscape designer, and they are now believed to be among the best gardens in the country. Visitors can enter the grounds of the shrine for free, however there is an entrance fee which must be paid to visit two of the gardens, the sake museum and a museum which displays treasures of the shrine.